Click on the photo and see all the photos of Grand Hotel Downtown. WiFi available in all areas, Golf course (within 3 km), Restaurant, Room service, Bar, Sauna, Fitness centre, Massage, Airport shuttle, Airport shuttle (surcharge), 24-hour front desk, Newspapers, Express check-in/check-out, Safety deposit box, Currency exchange, Tour desk, Luggage storage, Lockers, Babysitting/child services, Laundry, Ironing service, Shoeshine, Fax/photocopying, Gift shop, Non-smoking rooms, Lift, Soundproof rooms, Heating, Non-smoking throughout, Air conditioning. Just 100 metres from Frankfurt Central Station, this 4-star design hotel offers air-conditioned rooms with tea/coffee facilities and free Wi-Fi. It has a sauna, a fitness centre and massages upon request. A flat-screen TV and safe are provided in each room at the Grand Hotel Downtown. Your bathroom includes a hairdryer. The Grand Hotel Downtown is located within a 10-minute walk from Frankfurt Trade Fair, the financial district, and Frankfurt Opera House. Trains run to Frankfurt International Airport in 15 minutes. Frankfurt Messe (Exhibition Grounds) is just 1 km away from the property. Please note that your credit card details is needed for safety / guarantee. 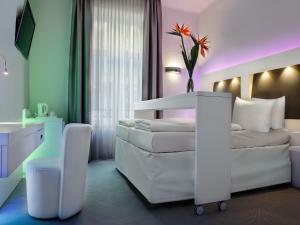 Alternatively you can also pay a refundable EUR 30 cash deposit per person per night at check in. Guests are required to show a photo identification and credit card upon check-in. Please note that all Special Requests are subject to availability and additional charges may apply.